“The fairy tale is over” she says to me with that smile that shifts just to the left, the one that tells me how much she loves me, the one where she is funny and beautiful and playful and clever all at the same time. She says it and I laugh. I laugh because she is funny and beautiful and playful and clever. I laugh because she is getting in bed many hours before I will. And because she is getting in bed with our two daughters, both of whom are climbing on her head, doing everything they can to physically separate us. I also laugh to try to hide, from her and from them, that a part of me feels like it sinks a little further down when I think about it. I shove a smile onto my face as I turn out the light and leave the room. I shut the door thinking of her and them and life and that picture of our feet jumps into my mind. It is one of those pictures that is more than just a second of time caught, more than just a blink among a billion others. It is a picture of an era and also of a moment that I would never need a picture to remember. We hadn’t yet been together a year and we were deeply in love. Our life together was fluid and rhythmic, fun and romantic. We didn’t worry about much of anything. We didn’t really have anything to worry about. I guess it was kind of like a fairy tale. And for my thirtieth birthday she surprised me with a trip to Amsterdam and to The North Sea Jazz Festival. For a week we danced and floated and laughed through the streets and over the canals in Amsterdam. On Saturday we took the train to the festival in The Hague and we danced some more. We took that picture as we sat on a walkway directly above one of the main stages, our feet dangling over the crowd and Roy Hargrove. This is a song from that very show. It was all like a dream in its perfection and surreality. I don’t think we stopped smiling or touching each other the entire week. Thinking of it now, it still feels like a dream. And, looking back, it feels like a different life and we were a different couple. I love our lives now, as maniacal and ridiculous as they seem sometimes, and I love my children and wouldn’t change a thing were I to have the choice. But I can’t say I don’t in some ways mourn the end of that fairy tale that we lived. Life was so simple then and we got to drink in each other fully and bathe in what we had become together. I remember reading an essay a few years ago by Ayelet Waldman for which she caught a hurricane of hell when she said she loved her husband more than she loved her children. I understood it when I read it and had one infant daughter and I understand it now with two wonderful little girls. I love my children. 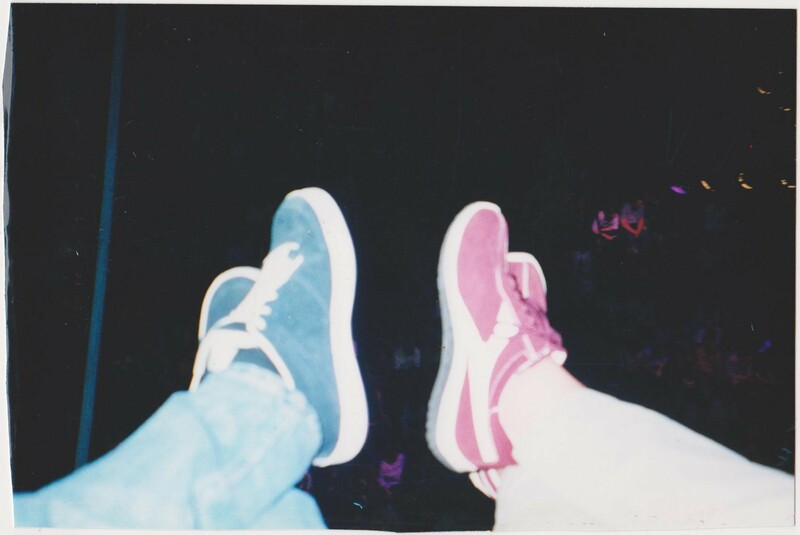 I am in love with my wife – more now than I could have even understood as we took pictures of our feet many years ago. But, all of that brings me to this – I am in love with my wife more now than I could have understood then because we started there and have experienced all of this and are now here. Together. Our children are not a barrier between us or a hindrance to what our life together can be. They are us. They are here because we love each other. It is easy to say that I mourn the loss of what we were because, on the surface, that was easy and this is hard. In that life we had no parameters or obligations. We were the kids and it was about us. And we were in Amsterdam, for chrissakes. In this life it isn’t about us at all. Now we have boundaries, rules and schedules. But now we also have two beautiful little girls to celebrate. The joy and significance that was just two is now four. It is easy to talk of mourning, but it is hard to understand that what we have now – what we are now – wouldn’t exist if we continued on that path, unchanged. The details of that fairy tale are fun to recall – the grand piano in the park, the characters in the clouds, the picture of our feet. But ‘happily ever after’ is a lazy way to end a story and it probably leaves out the best part. This entry was posted in Uncategorized and tagged Amsterdam, fairy tales, love, marriage, North Sea Jazz Festival, Roy Hargrove. Bookmark the permalink. I also remember that Ayelet Waldman essay, and how many people were horrified at her admission. In fact, at the very center of a loving family is two parents who love each other. After our kids grow up, we’ll be left with each other, and it will certainly help if we truly enjoy each other’s company. Thanks for this reminder and of the lovely walk down memory lane that you prompted in me as I thought about my “courtship” with my husband, and how nice it is to remember those times and even bring them back! I couldn’t agree more, Alexandra. Without my wife and I firmly at the center I wonder what message the girls would be getting about the nature of relationships. Thanks for reading. I never read the Waldman essay but would just say that imho if your spouse is not at the very least right up there with your kids, well, that doesn’t bode well for your marriage. Because it is as Alexandra says above and the kids really do eventually grow up. “‘Happily ever after’ is a lazy way to end a story and it probably leaves out the best part” AMEN! I meant to put a link into my post – I’ll go back and do that. And, yeah, that would be a pretty dismal moment when the kids left if my wife and I weren’t really pleased to see each other. Well said, Michael. Thank you. Love this, Mitchell. Well said. Pickle, I love you. Thank you for writing so eloquently the joys and growing pains of parenthood. Thank you for being the intentional human you are in all facets of your life. Thank you for marrying my best friend and for being my friend. And mostly, thank you for staking the knife of humanity into my heart when I read your beautiful pieces and making me cry. Sending you a huge hug my friend! And I love you, D. Thank you for making me cry right back, sister. Beautiful ode to your Valentine! New chapter in the Fairy Tale perhaps….. Thanks, Maggie. Many more chapters still to come. It takes a grown-up person to understand a grown-up kind of loving that happens after happily ever after. A sweet vision, Mitchell. Thanks so much, Wolf. So, when do I start actually feeling like a grown up?